On a recent stroll around Lee I passed the Leegate Centre. I noticed that where there had been three empty shops a gent's barbers had set up in one unit. The other two units were still empty and 15 Leegate stuck in my mind as it used to be the Abbey National. I'm pretty sure it's been empty for quite a few years and although Leegate isn't a busy centre I couldn't work out why it hadn't been used. So I decided to check out how much the rent is. 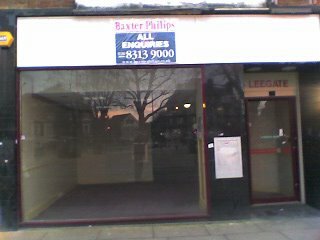 I contacted Baxter Philips who are the letting agency. They sent information to me, I'm not really interested in leasing it, but very nosey. Seems that first off, the "in-going tenant to make a contribution of £500 towards the landlords legal fees in the granting of the new lease." Okay. Seems odd considering the landlord wants to encourage interest but I don't know what the norm is, so let's move on. 15 Leegate is classed as having A1 use - that's shop, hairdressers, travel agent, dry cleaners "etc". It's 1488 GF sq ft and 1488 FF sq ft - a total of 2976 sq ft. Rent is £200 a week. So, how much am I looking at for my first year? I've not included the tenants legal fees. Now that's without paying any utility bills or staff wages or anything else you can think off. £800 short of £20,000 for your first year. Is there a passing trade to support any business to that amount? I now understand why it's still empty. that is a hell load of money for an A1 shop. cant see how anyone could rent the joint and get a profit. rented office space (from my dad) for a while two years ago and that was costly but still. something dodgy about the leegate space innit. I can't believe that when you're paying over 10k for the rent they still want to hit you for £500. But maybe it's standard practice? Leegate is never busy now - you'd need to be selling the secret of life to attract any business!